One of the most comforting things that you can do on a cold winter evening is curl up in bed with a good book and read. Now, it can be even better when you have a pillow backrest for bed. This comfortable pillow allows you to sit comfortably in bed without straining your neck or back. There are varying shapes and price ranges for the backrest pillows that are available. It is just a matter of finding what you like and what fits your body type. One type of bed backrest pillow is a triangular-shaped piece of memory foam material. This model is normally recommended for people with acid reflux. The pillow is not anything overly special. It is very simple and doesn’t offer as much comfort as one might hope. The benefit is that the wedge pillow can also be useful for other medical conditions. Snoring, sinuses, acid reflux and GERD are all helped by this backrest bed pillow. Plus, the cost of this accessory is nominal. If you are not sure what type to purchase, this may be a great starting point for experimentation. Another style of backrest pillow is the type that is shaped like a boomerang. This style gives the person many options for comfort. The main function of this configuration is to give aid to side sleepers. However, the pillow can be propped up so that you can use it as a bed reading pillow. It can also be used to help expectant mothers become as comfortable as possible while laying in bed. They are available online and in department stores and the cost is very small when compared to the benefits they provide. 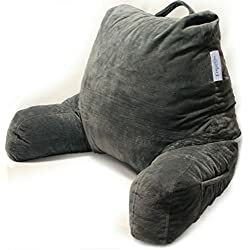 If you find that you are comfortable with this pillow, you may be interested in upgrading to a better option. Finally, there is another style available which is the bed lounge pillow. These pillows actually look like chairs but are made of a softer material and can be placed on your bed. 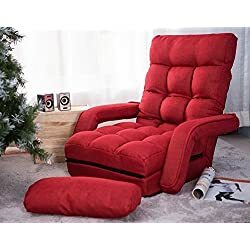 They are adjustable to different sizes and are fully functional as a recliner, support for neck and back and they have pockets to hold of all your remotes, books or other items. The benefit of this pillow is that it offers a higher degree of comfort and more stability for your back. Most of the bed lounger pillows are made of corduroy material. All of them have adjustable lumbar, headrests and are very flexible. This allows for you to get the chair in the most comfortable position for you. This option is a little pricier, but well worth the expense. If you are looking for a way to be comfortable in bed, there are many different options to choose from. The wedge offers comfort at an extremely affordable price. This option also helps with many medical issues. The boomerang pillow, while a bit more costly, gives you the ability to have arm rests while being propped up. Lastly, the bed lounge pillow offers a superior level of comfort and support plus it gives you the ability to adjust it to your particular body type. This selection is higher priced, but well worth the expense. 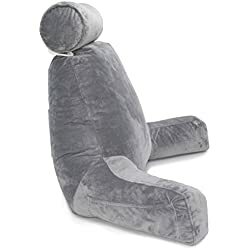 The decision to purchase a pillow backrest for bed is well worth it for your comfort while in bed watching TV or reading a book.